Vital to the smoooth running of the practice are our receptionists, Anthea, Michelle and Sarah. Anthea is a cat lover and is often involved in the rehoming of stray and abandoned cats and kittens. Michelle is currently building up a flock of sheep and can help you with your farming supplies; in particular wormers and vaccines. Our newest recruit, Sarah, is another approachable and friendly face to help you with whatever queries you may have. 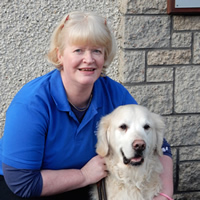 Jeannette Andrew is the practice principal, who has lived and worked in Huntly for over 16 years, and previous to that in Banff. She is a Glasgow graduate and truly mixed vet with a wealth of experience. Outside work she is an active member of the Huntly rotary club, and also spends her spare time doing pastel portraits of cats, dogs, horses and cattle. Sarah Oliver has worked at Strathbogie Vets since 2011. 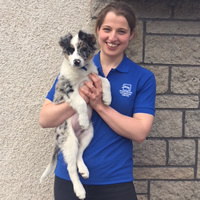 Also a graduate of Glasgow Veterinary School, she enjoys working in the northeast of Scotland and went to school in Aboyne. She has many interests but a lot of her spare time is spent walking in the hills or at the beach with her cocker spaniel Panda. 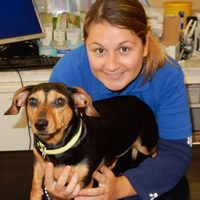 Charlotte Crisp qualified from Liverpool veterinary school and joined the practice in 2014. 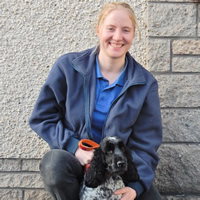 Although she is the newest member of the practice she is very familiar with the area having grown up in Kemnay. When Charlotte isn’t at work she can be found walking her miniature Dachshund cross Dorra, or riding her horses Ally and Charlie. She regularly competes in both Show Jumping and Dressage but her true passion is Eventing. Olivia Busson joined the practice from Glasgow University in July 2017 and has settled in well. Her spare time is currently spent training up her new collie pup, Gin. She also enjoys baking, walking and travelling. 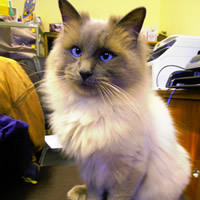 Last but not least is Louis, our resident office cat. He is a rag-doll.